(San Diego, CA) Today's newsletter from AleSmith had all sorts of great news. Included were details on Decadence 2011 and the seasonal release of My Bloody Valentine. Here are the details from the newsletter. "The wait is over! 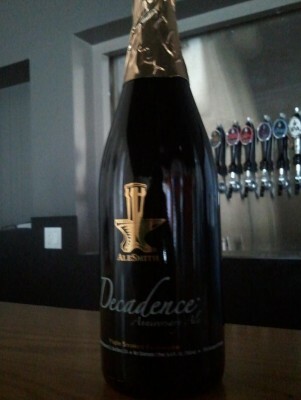 AleSmith Decadence 2011 has been brewed, bottled and will be released at the brewery on Wednesday, February 29th, 2012. AleSmith Decadence Anniversary Ale was originally brewed in 2005 to celebrate our first decade in business. Our brewers had such a great time concocting AleSmith Decadence that they decided to make it an annual event and brew a new style each year to commemorate our Anniversary. AleSmith Decadence 2011 was brewed to combine two styles, smoked beer and barleywine to create our unique homebrew-inspired Maple Smoked Barleywine. Containing a pleasant Bamburg smoked-malt character that richly compliments the pure Vermont Maple Syrup, AleSmith Decadence 2011 is sure to deliver a memorable drinking experience! The bottles will go on sale at 2pm on Wednesday, February 29th in the tasting room ($13.00 per bottle, six bottle limit) and will be available at better bottle shops and select retail accounts in the following weeks. There is a very limited amount of draft of this beer and we will only be offering tasters of the beer in the tasting room (no growler fills)." "February is upon us, bringing our annual My Bloody Valentine release. It's deep red color, caramel malt richness and abundant hops are the signatures of this unique ale. We brew a single batch of this tasty brew at the beginning of each new year so we'll have it ready in time for Valentine's Day. Samples and growler fills are available at the brewery during our retail hours. Look for My Bloody Valentine on draft and from the cask around town at San Diego premier beer bars and restaurants in the month of February!"